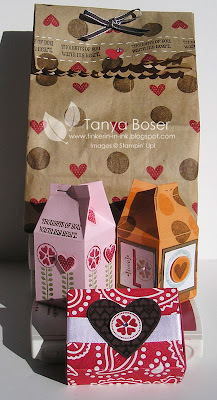 This is a little 3x3 card that I put a heart treat cup in. 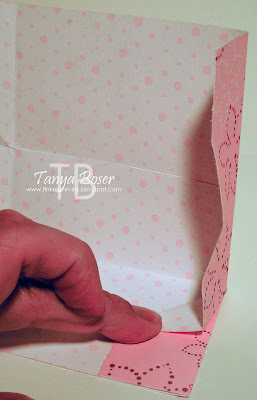 The inside of the card front has a pocket for the little slide out tag and the Full Heart punch is used to create the hole all the way thru so you can access the treats without destroying the card. You do have to punch each layer individually, but I just trace the heart where I want it punched on each layer and everything lines up fine. The dimensions of the inside pocket are 2-3/4" square and the tag is 2" x 2-3/4" with a Scallop Square cut in half and glued to the end. Be sure to only put adhesive on 3 sides of the pocket at the very edges so you can get the tag in and out :) The layers on the front are 2-3/8" square and 2" square. The Full Heart punch won't reach to punch exactly in the middle of the card front, so I added a little bit of the Ribbon edge punch to balance it out. Other: Full Heart punch, Ribbon edge punch, Scallop Square punch, Heart Treat Cup, Sticky Strip. I have a tutorial on how to make this candle box and the tea light candles here. It is a really quick and impressive gift. 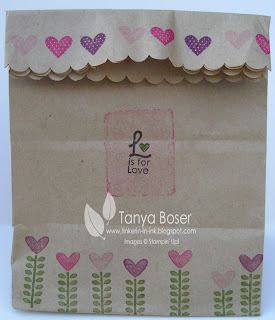 The color block behind the L is for Love is an acrylic block inked up with Blushing Bride and stamped onto the bag. 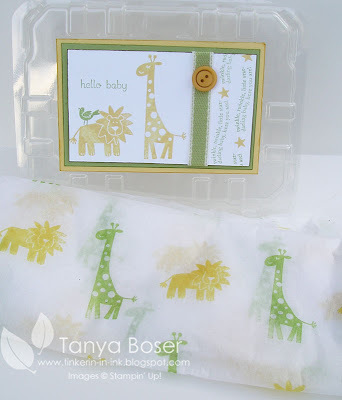 Then I inked just the edges of the same block in Melon Mambo and stamped again. Super slick! The top of the bag was trimmed down about 3" while the bag was still folded flat. Then I scalloped the top with the Scallop Edge punch- while it was still folded flat. Then I stamped the hearts along the edge so they would be right side up when folded over. I will probably punch a couple holes in the top with my Crop-A-Dile and tie it shut with a ribbon. Welcome to another fun filled Blog Hop! We are all very excited to show you a sampling of the new Holiday Mini that starts September 1, 2010. There are so many amazing things in the new Mini, it's almost hard to know where to start! Well, we are here to help you decide which items you have to have the most, lol. I am the last stop on the tour, so you may have arrived here from Candace's Blog featuring Christmas Postcard. Don't you just love her ideas?! If you want to see the full list of blog stops and navigate from there, just click on the banner above. Well, I am going to show you several ideas with the set Filled with Love. It is available as a Clear Mount set (#121154 $16.95) or as a Wood Mount set (#120839 $22.95) and coordinates with the Full Heart punch, Heart Small punch, 3/4" circle punch, and the Heart Treat Cups. And as you will see, this set can be used for far more than Valentines Day! The 3x3 card has a tab at the side to pull out so that you can get to the treats in the treat cup without destroying the card. The bag is a plain old lunch bag with the top trimmed down a couple inches and punched with the scallop edge punch (with the bag still folded up and closed) and then stamped to coordinate with the card and candle box. ETA: I have burned these tea lights without any problems. The tissue paper does not not cause a flare of flame when the candle is burning. Here is an 8x8 2 page scrapbook layout. 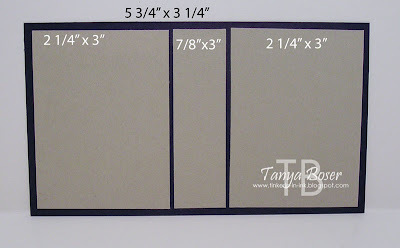 Yes, I did say 8x8 :) We are getting 8x8 albums in the new Holiday Mini! I am so excited!!! See how you can make this set feel like Autumn and a little masculine?! Notice the shine on the little hearts on the right hand page? I covered them with Crystal Effects to give them shine and dimension, then popped them up on dimensionals. There was a lot of stamping off on these pages so that the images would be subtle. Other: Signo White Gel Pen, Full Heart punch, Heart to Heart punch, Heart Small punch, Crystal Effects, Stampin Dimensionals, Bitty Buttons, crochet thread with a needle, Glue Dots, SCallop Square die with Big Shot. This is a pair of cards I made using the Faux Reverse Letterpress technique. I really wanted to use the new Letterpress plates that are coming in the Holiday Mini, but they were not available to preorder... I will have to wait until Sept 1st like everybody else, sigh. But these are cool too! 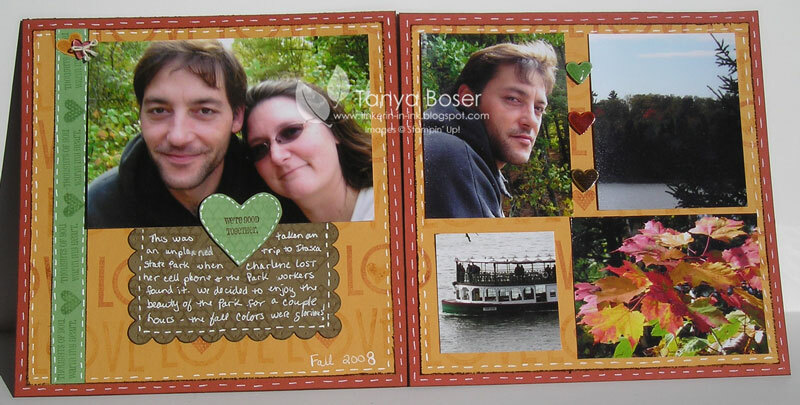 I used the texture plates with the Big Shot and inked up the plates before running the card stock thru the machine. I didn't have my brayer with when I made these so I just rubbed my ink pads right on to the texture plates and that worked great too! 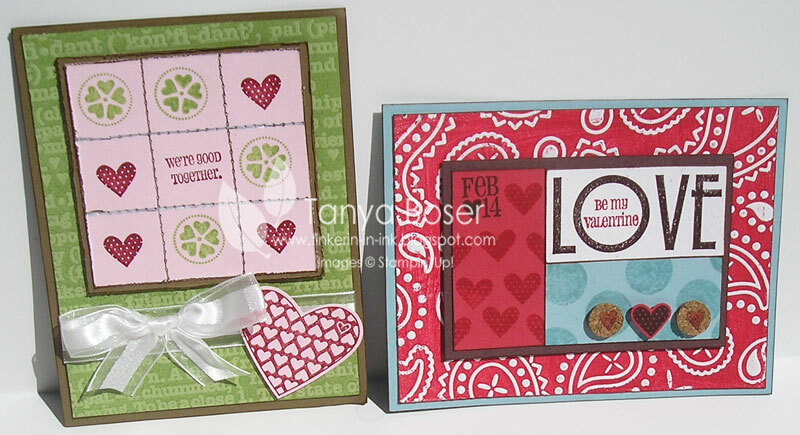 The card on the right was made using a Sketch Challenge over at Stampin Addicts. 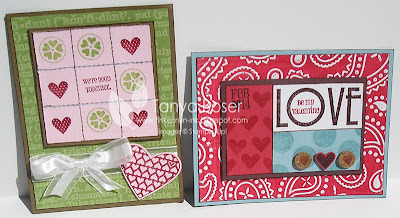 The little hearts stamped on the cork circles are from the Feb 14 stamp, and the polka dots are made with the circle of rubber that was die cut out of the O in love. LOVE that little circle! And you won't get any extra ink in the middle of your O this way either. And my last group of projects are some quick 3D projects. Another gift bag (this one is holding spools of retired ribbon a customer bought), a matchbox using the Faux Reverse Letterpress technique again, and a couple of Mini Milk Cartons. I hope you enjoyed your stop here on my blog. Now on with the show! Now I just hope my friend starts to feel better soon! 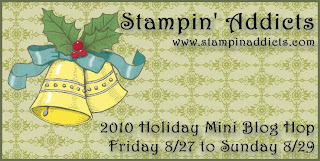 Don't forget to stop by Friday August 27 thru Sunday August 29 for another fab Blog Hop! Come check out my "garage sale" ! I have posted a bunch of stamp sets that need to find loving new homes and you can find then here on my Items for Sale page. I will also be posting some accessories like ribbon, rub-ons, ink pads, and paper soon. I found this idea on Mike Funk's blog and just fell in love with it! But Mike's listed measurements were off a little so please use the measurements I will list below. Of course, I didn't have the set that he used, which is adorable by the way and only available until August 31st. So I used the owl that I love so much :) We made these at club on 8/12/10 and they turned out really cute. I am going to try to do a mini tutorial on these. Cut out matchbox and assemble box bottom. Crease all other folds. Decorate all pieces as desired. Assemble the lid of the box. Adhere the inside pieces to the back of the book cover piece as shown in the picture below. Basically you are adhering the 2 larger pieces so that there is an even margin around the 3 outer edges. Then adhere the thin middle piece centered between them. Crease between the pieces with bone folder and paper cutter. Put sticky strip on one side and the bottom of the box lid. Adhere the spine edge to the inside of the book cover first, then adhere the bottom. Tie ribbon around the box to keep the box bottom from sliding out. All done! I got one of these from someone in a swap from convention and I had to make some myself! We made these at club on Thursday night, and my ladies tell me it was the easiest project of the night, lol! These little cuties will hold a lot of different things... chapstick, nail polish, lipstick, jewelry... all kids of cute little things! I'll try to do a little tutorial. two 1" x 3-1/2" pieces of card stock scored down the middle at 1/2"
On the 6x6 piece, Score 2 sides at 1-1/4" from each edge, turn 90 degrees and score the remaining 2 sides at 2-1/4" from each edge. See figure A below. Crease all score lines well. Then bring the corner to the edge and crease a diagonal fold as shown in figure B below. 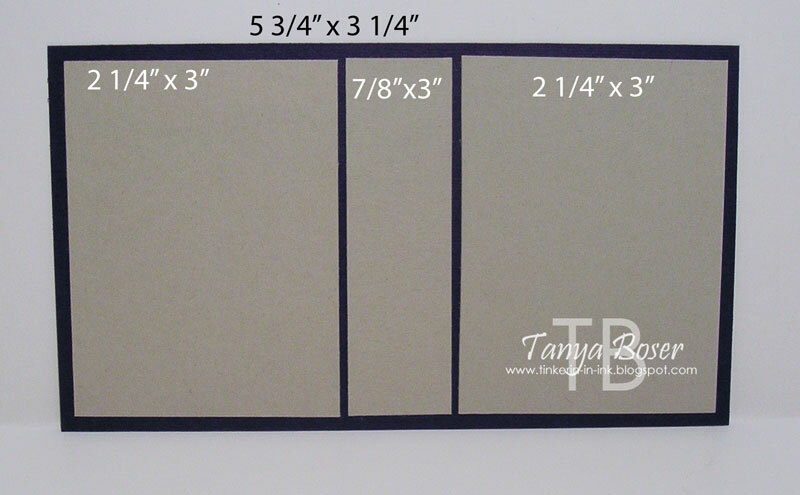 Use Crop-A-Dile hole punch to punch a hole 5/8" in from each end of the 1x3-1/5" pieces of card stock. These are for the ribbon ends to slip through. Adhere ribbon ends inside by placing a strip of Sticky Strip over the top. Put another strip of Sticky Strip on the other side of the crease inside the piece. 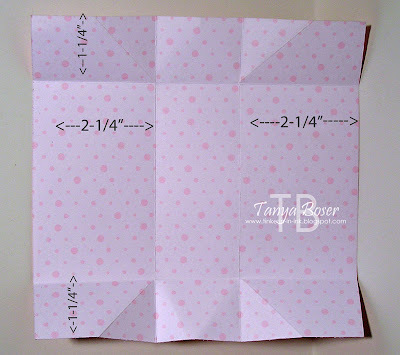 Lay the 6x6" piece inside pattern facing up, fold the 1-1/4" sides in. Adhere the purse top/handle pieces to each end. Pull middle sides out as you fold pull the handles up and your purse should take shape. Apply your velco pieces to keep the purse closed. I became an auntie again on July 24th! Grayson Phillip was born to a very happy Jeff & Heidi :) This is the gift box I made to give him a little something. It is made with a mix of new and old, but we all know there are some things that we just can't part with even if you are a demo (me) and it is retired (Wild About You set & Small Sayings) because it is just so darn cute! I used another cherry box and stamped on the tissue paper also. Instead of a card, I made a piece of decorated card stock that was adhered to the underside of the lid with our message to the little one. It made such a cute package!! I was able to fit a newborn sleeper in it. Too bad I couldn't find one with giraffes and lions in Pear Pizazz and So Saffron, LOL! I was even able to give this to Grayson when he was still only a few days old, which is amazing since they live about 4 hours away... and he is such a little cutie pie! I got to rock him to sleep when he was being a crabby-pants :) Ok, on to the recipe! Off to go see if I can keep this Mojo going! I was not able to attend Stampin Up! convention this year.. I know, very sad. But I had a very special lady help me out! 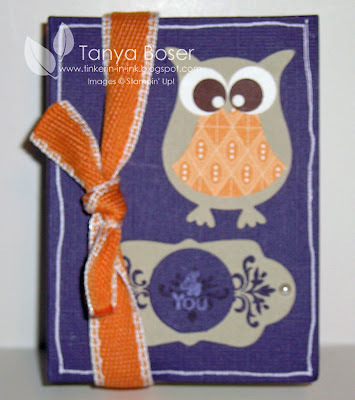 Her name is Crissy, and this is the card I made to go with the mini milk carton gift you can find here. 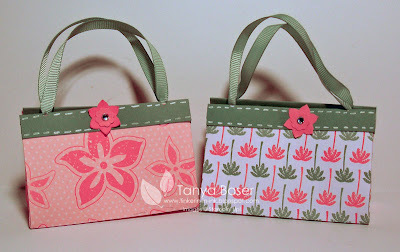 I used the same colors, but none of the same stamps and it still coordinates well, which is the beauty of stamping and Stampin Up! This is a little 2-1/2" square care I made with scraps. I am trying very hard to use up the excessive amounts of scraps I have-they are stressing out my storage system! 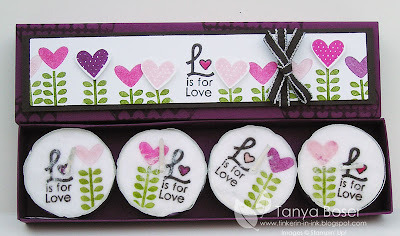 I punched out four 1" circles then inked the edges and stamped the little heart from the Tiny Tags set on them in the coordinating ink. I was trying to draw a nice even circle outline on the sentiment circle but I think it has a messy charm to it this way :) I am hoping that this card has made it to Crissy before this post is up! I hope you like this card as much as I do! Go check out my store if you would like to purchase any of the supplies to create this card.